I don’t want to say I’m pleased, of course I’m not. But I can’t help but thinking that my father’s heart attack comes at a pretty good time for me. Things haven’t been going so well here in California for me, money wise. Yeah, I’ve had some tough times. Nothing a sharp businessman like me can’t handle, you know, but an influx of funds right about now would help me get out of some sticky situations. I’m my dad’s only child. He and my mom are divorced and I know Grace, his new wife, has some serious health issues. So who else would dear old Dad give power of attorney to? Yeah, I haven’t seen him for years. I’ve been busy, you know. But he’s still my father. I’m thinking the Yuletide Inn, that big hotel he owns in Rudolph New York, is a lot of work for him and Grace to manage. I’d be doing them a favour, really, if I sold it to Best Budget Inns. Not sell, more like taking a franchise opportunity. We could save a lot of money if we cut out the expense of that fancy restaurant too. A New York City Chef, baked goods made by Victoria’s Bake Shoppe in town, locally sourced meat and vegetables? Not needed. We can reduce prices (a little bit) if we cut those extra costs (a lot). And then there’s the huge garden. Yeah, I know the gardens at the Yuletide Inn are one of the highlights of Rudolph, New York, which calls itself America’s Christmas Town. But all that land doing nothing but looking pretty in summer and providing guests with a place to toboggan or skate in the winter? Heck, it’s the perfect spot for a Mega-Mart. The people of Rudolph might not care for my plans. After all, they take that whole Christmas Town thing mighty seriously. Can the Yuletide Inn be saved? 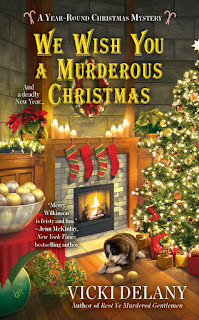 Find out in We Wish You A Murderous Christmas, coming November 1st from Vicki Delany and Berkley. Are you a homebody at Christmas or do you like to travel for the holidays? Are you strictly winter-tradition or is December the best time for a Caribbean beach holiday? Let me know and you might win a copy of the first book in the series Rest Ye Murdered Gentlemen. Be sure and give me your email address, so I can contact the winner. And then head over to Vicki’s Facebook page (https://www.facebook.com/evagatesauthor/) for more chances to win throughout October. Contest closes Monday Oct. 3. US and Canada entries. I'm a homebody at Christmas. I've been doing the family parties at my house pretty much since my grandmother died, so I guess that makes me more of a homebody. I love the crazy family fun so I'll keep doing it as long as I physically can. =) Then maybe I'll check out the beach. Crazy family fun! Me too. We usually travel for the holidays because our daughters live out of town and this year will be extra special since both daughters and husbands now have children. dbahn(at)iw(dot)net. I'm a homebody at Christmas, and love having all the kids and grandkids come here to celebrate. eeyoregirl2009 AT aol DOT com. We're a homebodies, too old for traveling, so my daughters and I baked some bread and gingerbread cookies. Wish my sister could come over. I try not to travel during the holidays other than a short car trip to visit relatives. We stay home during the holidays---I'd love to travel but the hubby says "no". I'd love to read that book during the holiday season---thanks for the contest. I like a family celebration so after exchanging gifts at home we gather a someone's home for the day. Everyone brings a part of the meal to the larger gathering so no one has a really big job. Each family also brings cookies and other desserts for the meal and to exchange for the days after the holiday. I would love to win but either way it was fun to see the sneak peek at the town grinch. Sharing the work is a great idea. A favorite time to decorate and lots of baking to be done. We always have a traditional Christmas however I would love to do something totally different for Christmas. Thanks for the chance to win this lovely giveaway! My family went to Mont Tremblant skiing one year. We rented a chalet. It was fabulous. Total homebody!! Love to decorate and re-create traditions I remember from childhood. 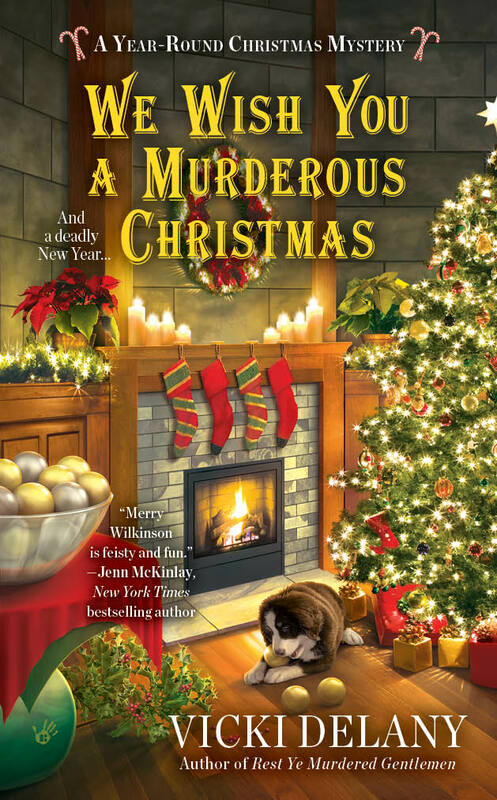 And love to read Christmas mystery and romance!! I usually like staying home. If weather permitting I'll go and spend holiday with my daughter and family. I live across the country from my family, so always travel for the holidays. Thanks for the chance. I am homebody. You never know what the weather will be snow or ice. So I like to be home. Nice to be able to do that. My mother always comes to my house. We stay home for Christmas. Used to travel and enjoyed it, but now prefer to stay home. Wherever we are must have a traditional holiday! We have one daughter and two grandsons, who do not get much time off at Christmas and live across state from us so we go to them for Christmas. And I would not have it any other way. December we do travel some because our anniversary is in it but we are always home for Christmas with the family. I am definitely a homebody for Christmas. I don't care much for traveling and like the comgfirt and safety of my home. so definitely a homebody!!! That's the whole idea of Christmas, right?? We had a great Christmas one year when we all went to Mont Tremblant skiing. We were all together and that's what mattered. I am a homebody.I love the winter and Christmas just would not be the same without the cold crisp air. Thank you for the opportunity to win. I'm definitely a homebody at Christmas. I like spending time with my family. 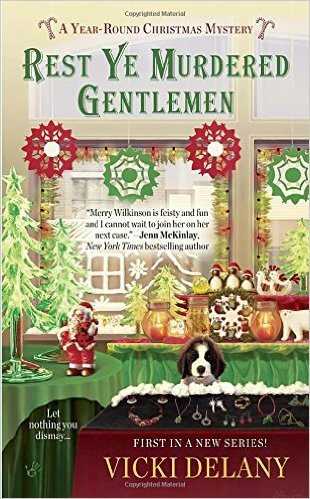 Really enjoy reading Christmas books around the holidays, looking forward to reading your new book. use to be family thing but now it's only my daughter and me so a friend a work invites us over to spend holidays with her family..we've become part of their family..we're very thankful.. I'm a homebody. There's something nice about staying in, especially if there's snow, with your family! The books look awesome to read! Christmas is one of my favorite holidays! I travelled for several years....now I enjoy staying around close to home!!!! I am a homebody at Christmas. My son and his fiance decorate our house so beautifully and my son does a huge Christmas Village too. I love to enjoy all the decorations at home with my family. we love to go to buffalo to visit my parents! love all the snow!! It would be fun to do something different one year. Thank you for having the giveaway and the chance to win! I am a homebody during the holiday seasons. I love to stay close to home and the families usually get together then I can come back home and cuddle up and read in the evenings which I love to do! Everyone usually travels to me as my daughter has allergies. Homebody. Many lovely traditions to enjoy throughout December and especially at Christmastime. I'm a homebody, but we live in Florida, so we don't have white Christmases. I'm definitely a homebody at Christmas and don't like to travel during the holidays. Thank you for this chance. I have had many different Christmas celebrations. Growing up with the traditional holiday including heading off to Grandma's snow-covered cabins, but a destination affair proved to be delightful. I love the cold weather, pine scented trees, and all the literally heart-warming foods, but Disney World and Hawaii offered wonderful memories of shorts and flip flops, palm trees, and Christmas morning on the beach. Homebody, most of the time unless my kids want to go to Lake Tahoe. Thanks for a chance to win. I'm a homebody. I'd rather have the family decend upon us. I'm a homebody for Christmas and always have been. The thought of traveling at Christmas actually depresses me. I'm a homebody, I'd rather stay at home than travel. Sounds like the verdict is in: We're Christmas homebodies! Oh, my! He sounds like a very greedy humbug and needs his comeuppance. Definitely a homebody. Christmas means home and family to me! Thanks everyone for entering my contest and telling me your Christmas traditions. I have contacted the winner. Forgot to tell you the winner's name! It's Patty Kovich. Congratulations Patty. I have send you an email.